The Infant Jesus of Prague, a much celebrated statue, is housed inside the Church of Our Lady Victorious (Kostel Panny Marie Vítězné). The statue is credited with miraculous healing and, amongst other things, with saving Prague during the Swedish siege of 1639. The statue is 47cm tall and made of wood, with a moulded and coloured wax surface. It represents Jesus at 4-5 years of age. The face has a unique expression that cannot be captured by any copy. Moorish features can be seen in the face and the hair was once darker, reflecting its Spanish origin. The Infant Jesus of Prague was brought to Prague from Spain in the mid-16th century. It was then gifted to the monastery at the Church of Our Lady Victorious in 1628 by Polyxena of Lobkowicz (a noble family who inhabited Lobkowicz Palace). The statue is dressed in royal robes that were once decorated with precious jewels given as gifts by worshippers. The most valuable jewel (since lost) was a copy of the Order of the Golden Fleece. The crown that adorns the Infant Jesus is a gift from Pope Benedict XVI, who crowned the Infant Jesus during his visit to Prague in 2009. The Infant Jesus blesses with his right hand, while in his left he holds a symbol of his rule over the world – an imperial orb topped with a cross. Veneration has spread around the world, from the United States to Australia to India, but it is strongest in Spanish-speaking countries; in Spain and the New World. News of prayers to the Infant Jesus of Prague being miraculously answered comes from all over. 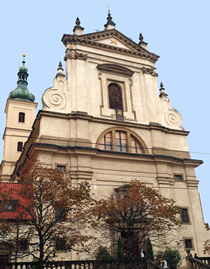 The Church of Our Lady Victorious is located in the Lesser Town, near the Lesser Town Square, and 5 minutes walk from Charles Bridge. The Church of Our Lady Victorious was built by German speaking Lutherans in 1611-1613. It is part Renaissance, part Baroque, in the manner of a Roman basilica. In 1636-1644, a reconstruction by the Carmelite order gave the church its present façade; the original side entrances were discarded in favour of a single one facing the main road. A large monastery for the Discalced Carmelites was also attached to the church. In 1669 a tower was added. For further information on the Infant Jesus, the church has a free museum dedicated to the statue, displaying the various robes and crowns the Infant Jesus is dressed in. The museum is located to the right of the main alter, up a spiral staircase.